I'm so happy you're here! Thanks for visiting again to take a quick peek at my next coffee-themed card. I had SO much fun creating each one, and I'm excited to be sharing them with you all....one at a time. I hope that you enjoy seeing them even half as much as I've enjoyed creating and sharing them. This card was creating using some fabulous trims from Really Reasonable Ribbon. I started with some sweet patterned papers from Echo Park that I machine stitched together and inked on the edges, and I added half of a white doily. Next, I ran a piece of Lipstick Red Seam Binding across my card and tied a bow with it and some Bay Leaf Seam Binding. That's topped with small bows tied with Cherry Baker's Twine and Teal Baker's Twine. The bow is finally accented with a sweet 14mm White Flower Shaped Flatback Round Pearl from our Embellishments section. I added an October Afternoon journalling sticker and stamped my sentiment there. I also added a small OA sticker at the bottom (to: with candy canes) and a cute little chipboard cocoa cup with marshmallows. You can find lots of cute trims and little accents for all your projects at Really Reasonable Ribbon. It's a great time to work on that Christmas wish list! 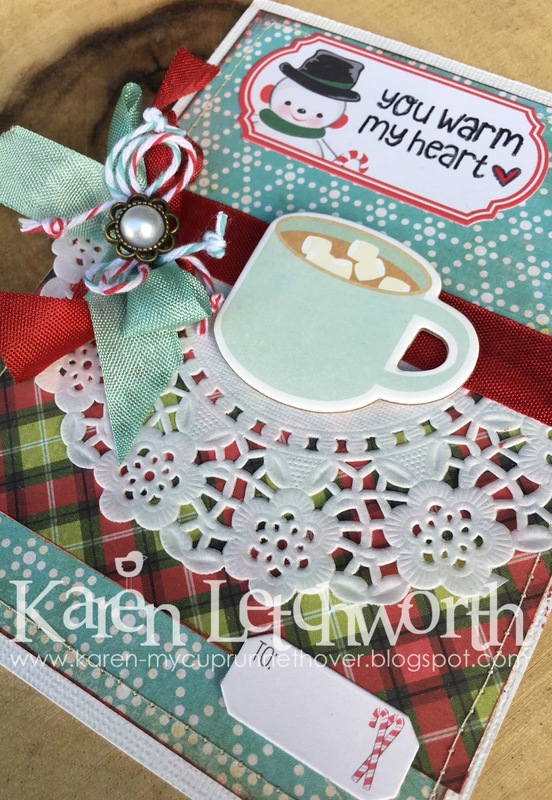 Winter Coffee-Loving Cardmakers Blog Hop - Anything Coffee, Tea or Cocoa Related With a Winter theme. 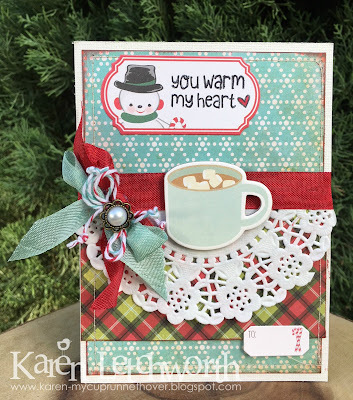 I used a chipboard cocoa mug for this card. It looks SO yummy! Visions of Sugarplums Challenge - Lori Hairston's ChouxChoux Paper Art - The inspiration for this challenge is so yummy! Another fun creation Karen, Love the color combos and mixing of pp with all elements! Another beautiful and so sweet creation! So pretty! Love your ribbon treatment so much! The colors are so YUMMY! Thanks for hopping along with us! Oh this is an ADORABLE card - love all the sweet details. So gorgeous and beautifully constructed. That cocoa looks yummy too! Your card is just adorable! Love the papers and your ribbons! Lovely work, awesome aqua + red combo Karen. Beautiful ribbons and gem. Your image is too cute. So cute. 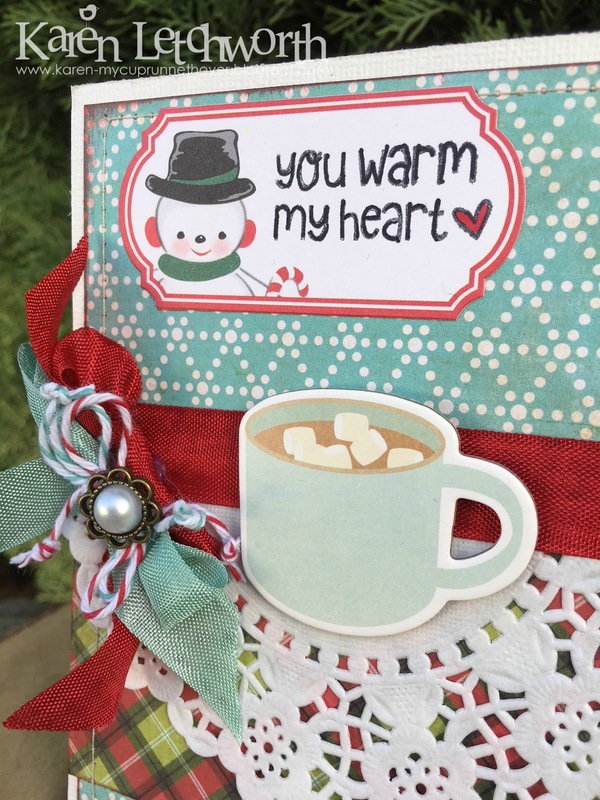 I love the doily and hot chocolate and marshmallows.. although I need a lot more of them.. Beautiful card. So sweet. I like the doily and the papers.